San Leandro still doesn’t have any good, affordable places to go for breakfast/brunch, so on the rare occasions when we treat ourselves to morning food we usually go to JD’s in Castro Valley. Their food is good, though not great, but I know what I’m getting. 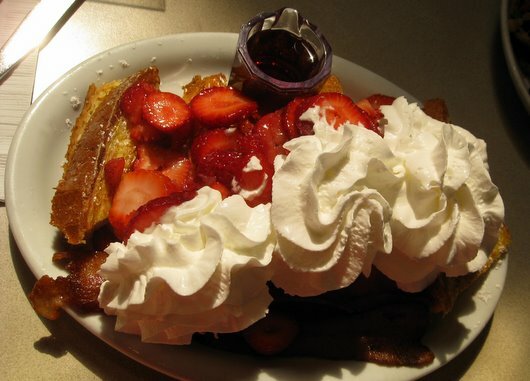 What I got during my last visit – what I always get – is the ricotta French Toast, covered with fresh strawberries and cream. This is an impressive dish and quite good, though I can’t help to feel it’s missing something. Sweetness perhaps? Macerated strawberries would be nicer, I think. The crispy bacon it came with was very good. This dish is “market price”, and I don’t know how much it was, probably in the neighborhood of $10. 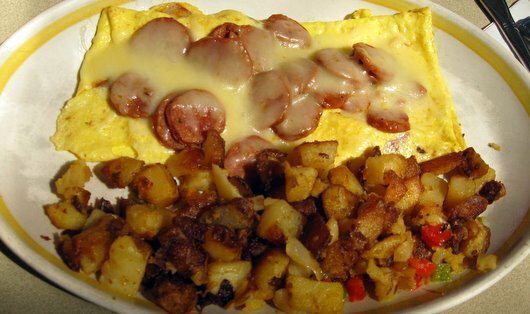 Mike had the Cajun omelet with andouille sausage ($8.50). He liked it, but wished the sausage had been chopped and mixed into the omelet. The accompanying potatoes were pretty good. In all, a solid though not spectacular meal. We’ll return, but wish there were better options nearby. I know this review was quite some time ago but…have you tried Elio’s Restaurant on Floresta (at Washington) in the Kmart/OSH plaza? We’ve been many times and have never had a bad meal there, whether for breakfast, lunch or dinner. The portions are large and the prices very reasonable. It seems like it’s always packed, which is a good sign. I went back once, when they had a “Coffee with the Cops” there, and I know I ordered some food, but it wasn’t memorable enough (either good or bad) to remember. I’m sure I’ll try it again some day, it’s pretty surprising that I haven’t.